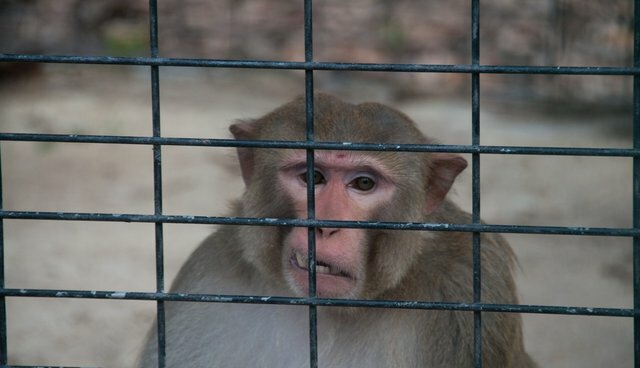 The HSUS' undercover investigations have revealed primates in psychological distress at research facilities and roadside zoos, and it's time to do something comprehensive about the problem. Today, we submitted a legal petition to the US Department of Agriculture (USDA) asking the agency to provide regulatory guidance directing research facilities, exhibitors, and dealers that breed and use primates on how the animals should be properly housed and cared for, since the current plan isn't working and primates are suffering. For example, at a laboratory in Louisiana, we saw primates engaging in self-mutilation due to extreme stress, tearing at gaping wounds in their arms and legs. At Texas Biomedical Research Institute, we documented abnormally high levels of aggression in primates kept in poorly managed social groups. At a roadside attraction in Collins, Miss., we found a monkey living alone in a barren enclosure, pacing incessantly due to boredom and anxiety. And at the unaccredited Natural Bridge Zoo, whose permit was recently suspended by the state of Virginia, our investigator witnessed newborn monkeys being taken away from their frantic mothers to be sold into the exotic pet trade. The USDA has a legal responsibility to provide oversight of care of primates - 30 years ago, Congress amended the Animal Welfare Act to specifically require that monkeys and apes, including chimpanzees, macaques, capuchins, and marmosets, be provided with enriched environments to promote the "psychological wellbeing" of these highly intelligent creatures. Over 100,000 primates are kept in laboratories and exhibition facilities in the United States. But the USDA's regulations have long failed to prevent unnecessary suffering in captive primates and the agency's own inspectors called for guidance over 15 years ago, conceding that current regulations are too difficult to enforce. Central to this essential reform is the need to prohibit the premature separation of mothers and infants, which experts agree causes long-term behavioral abnormalities and even changes the structure of an infant primate's brain. We don't doubt the importance of the maternal bond and social development in our own species, and we shouldn't be surprised that disregarding the similar needs of our primate cousins leads to significant psychological distress. The USDA is responsible for setting minimum standards to ensure the welfare of captive primates, and the action requested in our petition is long overdue. The National Institutes of Health recently instituted new requirements for keeping captive chimpanzees in ethologically appropriate environments, and the USDA should follow that example to develop meaningful criteria to improve the lives of captive primates.